In Windows 8.1, how to force prompt for credentials when accessing a shared folder? I have a computer with Windows Server 2008 ("R1") SP2, which I use as a home server, and another with Windows 8.1 ("Home"), which I use daily. There is no domain controller in the network. I'm logged at Windows 8.1 with user A, let's call it PC\AUser. There is no user A at the server. I have a shared folder to the user B, let's call it SERVER\BUser. 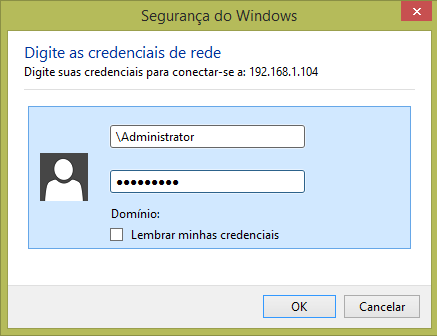 How can I force to Windows 8.1 ask for credentials when I go to start -> run \SERVER\SharedFolder\ ? For now I only receive this error: "You do not have permission to access \SERVER\SharedFolder. contact your network administrator to request access." I've been able to share the folder unprotected, by adding "Everyone" to the permission list. But as soon as I remove "Everyone", the Windows 8 client simply says "you do not have permissions to access this folder", without asking for any credential. How to force the prompt for credentials in Windows 8.1? So this shifts the problem into the Windows 8.1 client - the server is configured OK.
On request, this is the error message I receive. It's in portuguese, but experienced users will recognize the window. It says "Title: Network Error. Windows couldn't access [folder]. You don't have permission to access [address]. Contact the network administrator to request access permission." I have been able to connect to the share by using the "map network drive..." option and manually setting credentials there - but first I had to un-map the share using net use /delete because it seems Windows creates a stale mapping on the failed connection attempt (wtf?). This way, it is at least usable for me now. But will give the bounty reward if someone can solve or explain the issue of Windows 8.1 failing to connect with a permissions error instead of asking for credentials. Found the solution! I've posted it as an answer. The poster has found that after disabling the Guest account, Windows demanded a credential. I thought it important to add an explanation of this behavior (quoted from this source), that changed completely from after XP and starting with Vista. Windows XP introduced a concept called Simple File Sharing that, when enabled, entirely eliminated security for file sharing. All network access was done in the context of the Guest user account, regardless of the remote user's actual account name. Essentially. anyone with physical access to your network could access any shared file. This made it much easier for other people in your home and office to get to each other's files. Windows 8, 7, and Vista also include Simple File Sharing, although it's now called Password Protected Sharing. And, the effect of disabling and enabling the feature is reversed on the two newer operating systems. Finally. Windows 8 and 7 have a new twist in the way that security works when Password Protected Sharing is turned off. 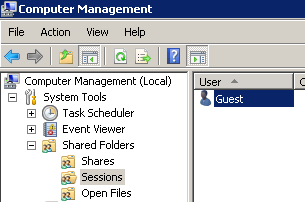 On Vista and XP, when passwords are not required, all incoming network access uses the Guest account. Thus, anyone on the network can access any file in a shared folder if the file can be accessed by the user account Guest or by the user group Everyone. If the remote user's account matches an account in the sharing computer but that account has no password set, then the Guest account is used. 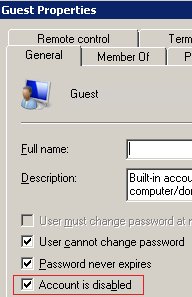 If the remote user's account matches no account in the sharing computer, the Guest account is used. This was not the answer that worked for this post (see my other answer), but it might work for other people in different situations, so there is no point in down-voting. You may have already used some credential when connecting which doesn't have the necessary permissions, or that had them once and now doesn't any more. Windows will insist on using that useless credential for every connection, resulting in a really nice gotcha. Click Remove from vault to delete. In a Command Prompt that is Run as Administrator, enter net use * /DELETE. Access to the share is user-based, not password-based. make sure that same user also have necessary rights on filesystem-level (this are separate from share rights, yet both are required). Afterwards, use the that user's login and password when accessing the share. Fiddling with the server, I decided to check the "Sessions", under Shared Folders in Computer Management. Surprise, my Windows 8.1 computer was connecting with a Guest account! Not the answer you're looking for? Browse other questions tagged permissions windows-8.1 network-shares windows-server-2008 or ask your own question. Why can I access some shared folder and not others? Why does turning on password protected sharing have no effect under Windows 7? Why can't domain Users map network drives?